Twenty-three-year-old Omar Haidar is lean and muscular, with a neatly cropped beard and the kind of laid-back grin that suggests a peacemaker, which he is — usually. But there’s also a reason why his nickname is “The Iraqi Assassin,” and why he’s groomed a reputation as a man who will pummel your head into the dead leaves and gravel of an unkempt backyard in Harrisonburg, Virginia. Harrisonburg is one of those places that has a split identity, between the gentrified college-town vibe around James Madison University and the industrial, working-class brutalism on the (literal) other side of the railroad tracks. It was a relief, nonetheless, when Haidar moved there as a young teen in 2009, leaving behind his hometown of Basra, Iraq — the site of some of the deadliest fighting during the U.S. invasion of Iraq in 2003, with violence from both U.S. forces and the Islamic sects vying for control in the conflict’s aftermath. Haidar fought kids he believed would rat out him and his Sunni family, but the chaos caught up to them: His sister and father were shot during a militia attack on a neighborhood mosque. They survived, but the bloodshed forced them to seek asylum under the U.N.’s refugee relocation program, which brought them to Harrisonburg. 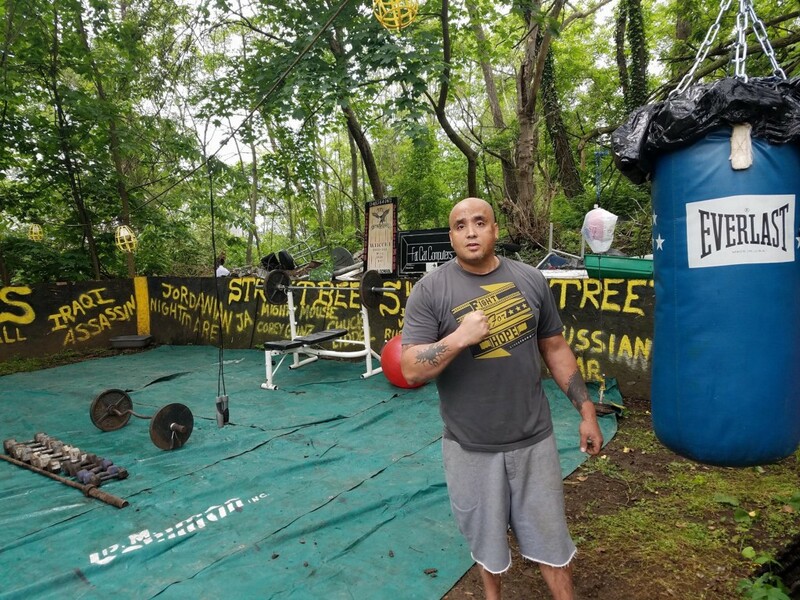 Scarface is 40-year-old Chris Wilmore, the man who founded the fight club named Street Beefs in his backyard in 2008. Wilmore is hard to miss, with a body like a block of sandstone and web-like scars that run from his shaved head to his soft almond eyes. He’s spent most of his adult life working as a personal trainer, and today he lives in an old, modest house with his wife Amy and four kids aged 13, 12, 2 and 1 (he also has a fifth child through a previous partner). 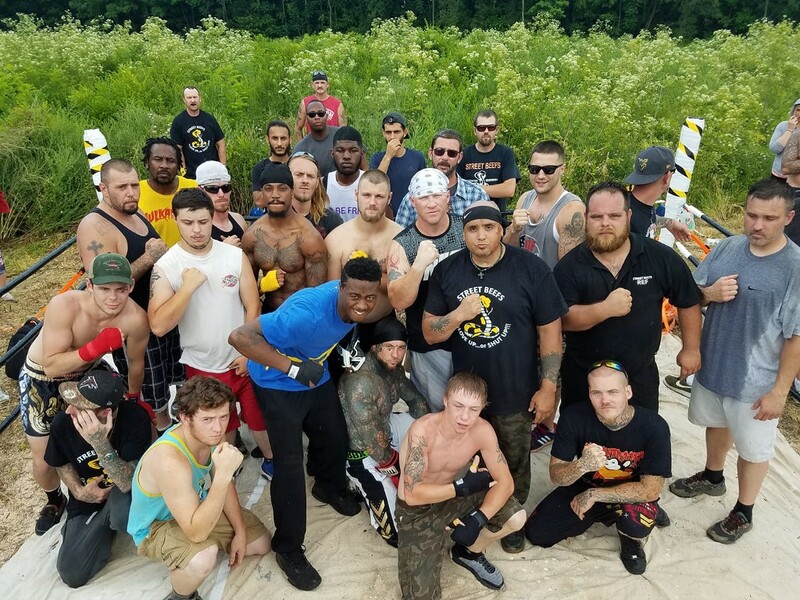 Anyone could bring their beef to Wilmore and Street Beefs, which was sanctioned and legal under Virginia’s state rules on amateur mixed martial art events. 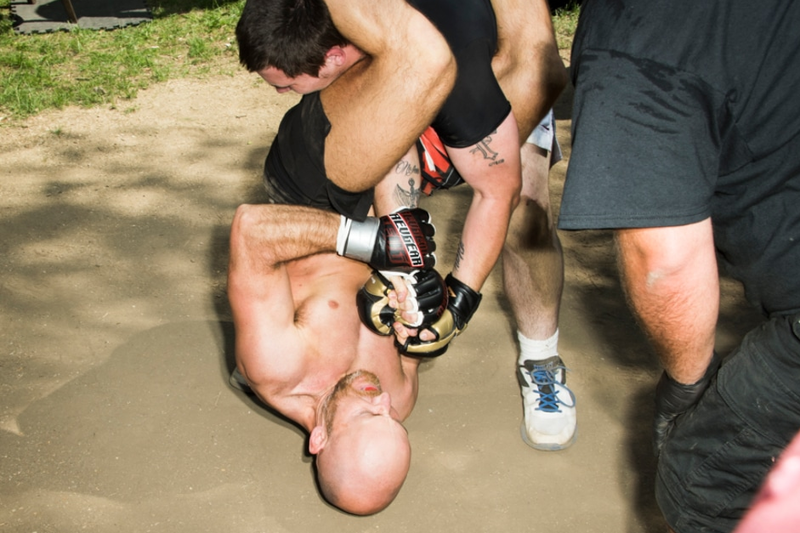 A handful of states require fighters in a promotion to be sponsored by gyms or take health-screening tests; many others, like Virginia, are more or less hands-off with regulations. So Haidar took Wilmore up on the offer, and brought in opponents who had messed with him in rugby practice, insulted his friends or just proved an interesting challenge. Four years and nearly 30 fights later, Haidar is one of the legends of Street Beefs, feared by newcomers and loved by online fans from across the country. In his very first Street Beefs fight, he took on a local man who had harassed Haidar on-and-off for two years, cracking insults about his looks and ethnicity. He knocked out “Taz” in the second round with a flurry of punches that ended with a stiff right hook to the jaw. Later, he challenged another local who had joked about Haidar being a “terrorist” one too many times. Watching the bout, it’s clear the men have raw technique — there’s not much of the patient reading and reacting that professional fighters display, or much precision in the way strikes are thrown. The skillsets fit the humble venue, which Wilmore gave the tongue-in-cheek name of “Satan’s Backyard.” The makeshift ring grew over the years from a circle of spectators in a wooded yard to a janky assembly of boxing ring posts and ropes, but nobody seems to mind the low-budget gear — the homegrown flavor is part of the appeal. Street Beefs is itself a minor sensation on YouTube, with nearly 500 videos, more than 300,000 subscribers and 86.2 million total views. The vast majority of those videos are unedited fights, shot with amateur production value. What happens after Wilmore starts the fight really depends on who’s in the ring — sometimes it’s two guys who know real striking or wrestling technique, other times it’s two guys who clearly haven’t even fought a punching bag in years. Some come out of the opening bell swinging, kicking and burning all their gas in one desperate, angry go. The experienced ones, though, tend to play it slower, eyeballing their opponent from behind raised gloves, waiting for the right openings to exploit. The men and women who are there to settle a grudge predictably tend to start fights hot with emotion, while those just testing their mettle in sporting bouts show a more measured approach. Wilmore never imagined in 2008 that his little fight club could attract viewers from around the country. Raised by a single mother who couldn’t kick a drug and alcohol problem, Wilmore lived in a series of cities growing up, with Pittsburgh and Harrisonburg the most consistent stops. When he was just five years old, a fire raged through the three-story home he lived in. His mother was drunk, but survived. He walked away with burns on his face and torso — hence the name “Scarface.” His baby brother wasn’t as lucky and died. That’s why Wilmore makes it a point to hit the streets himself, sourcing intel on potential feuds and making visits to arrange potential fights or just face-to-face talks, between people whom he believes are on the verge of violence based on what he’s heard from friends and acquaintances. A few years ago, he even paid $1,000 out-of-pocket to settle a beef over a perceived debt between two men. Wilmore’s reputation has attracted a big, diverse crowd of fighters; black, white and Middle Eastern faces readily mingle at training sessions and fights. Many come because of a legitimate grudge, others just for the challenge of fighting. Some, like “Icy” Mike Pesesko, an MMA trainer from South Carolina, came to Street Beefs for a slightly goofy feud: One night he got drunk and started arguing on an internet forum with “Ninja” Ron Collins, a self-professed martial arts expert that Pesesko considered a fraud. Many of the men and women in Street Beefs grew up around street fights, Wilmore observes, but only around 20 to 25 men have chosen to fight multiple times in Street Beef matches, with the majority phasing out after their first bout. Even the “OGs” don’t last too long, for myriad reasons. Pesesko grew a big reputation for his finesse in the ring, but is no longer taking fights (“My girlfriend would kill me”), instead choosing to help run the Street Beefs Facebook page, giving advice to newcomers and helping Wilmore with administrative tasks. Haidar is focusing on his truck-driving career — 70-hour work weeks make it tough to have the energy to fight all the time. And Chris Yarborough, aka “Mighty Mouse” and Wilmore’s right-hand man, has graduated from longtime Street Beefs OG to professional fighter, with his own budding YouTube channel and fan club. Wilmore has indeed gotten an offer to make a TV show out of Street Beefs, though the planning is still in the earliest stage. In any case, gaining exposure for exposure’s sake isn’t what captures his imagination. The income he gets from YouTube views has been a helpful addition to the pay he gets as a personal trainer, making it easier to pay monthly bills and buy gear for Street Beefs, but he won’t allow the fight club to become a spectacle with slick production and better fighters, he says, adding that the whole point is to see average people fighting and finding mutual respect. Nearly a third of Harrisonburg residents live at or below the poverty line, which informs why Wilmore hosts fights for free and recently transformed “Satan’s Backyard” into an exercise space with weights, a bench press and a sweaty shed for working punching cardio — Satan’s Makeshift Gym, if you will. The fights have been moved to a nicer ring on top of a hill a block away, on a property owned by a friend. It’s slow growth, but growth nonetheless, and Wilmore hopes it will attract young people from the city to see that even a bunch of former felons and street brawlers can rally around the Street Beefs philosophy and provide a community.